A proposal to bar city retailers from distributing single-use plastic shopping bags had its first airing Monday night before city councilors. The ban, if adopted, would add Ellsworth to the ranks of more than a dozen municipalities in Maine that have adopted restrictions on the use of plastic shopping bags or polystyrene food takeout containers. City Councilor Gary Fortier, who has been working with a citizens’ group advocating for the bag ban, had requested that the proposal be included on the agenda for the council’s Monday night meeting. 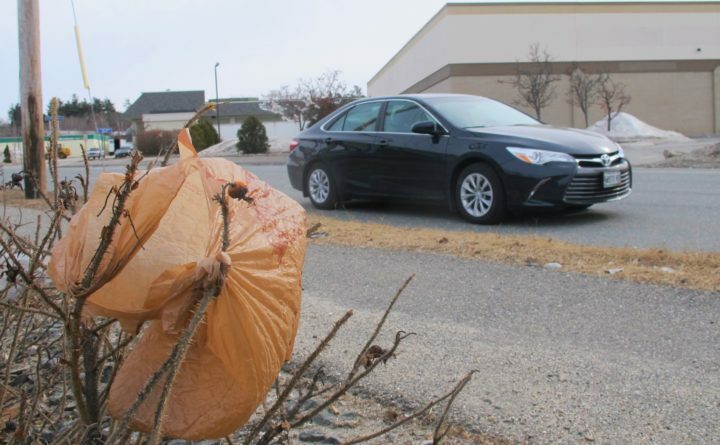 The proposal, however, immediately ran into some questioning from council Chairman Marc Blanchette, who asked members of the Ellsworth Green Action Team how many single-use plastic bags local businesses distribute each year and how many are recycled. Julia Ventresco, a member of the group, told Blanchette that local businesses have declined to disclose what quantity of plastic bags they give their customers. But nationally, she said, only 1 percent of plastic shopping bags are recycled. She said information about how many plastic bags in Ellsworth are recycled was not available. “If we don’t have the numbers, how do we know if there is a problem?” Blanchette asked. Ventresco said that even without Ellsworth-specific data, plenty of data show plastic pollution is having a severe global impact on the environment, though she acknowledged that not all of that pollution comes from shopping bags. Fortier interjected in the exchange between Blanchette and Ventresco. The purpose of Monday’s council discussion, he said, was just to present the idea, not to debate its merits. Council members and the public will be able to discuss the worthiness of the proposal at a not-yet-scheduled workshop. “You and I agreed this would be a presentation, not an argument,” Fortier pointedly told Blanchette. Local resident Mark Whiting offered some information about the scope of the problem. Every year, he said, he participates in an annual cleanup of Card Brook, which runs under High Street down to the Union River. Last spring, volunteers removed 800 pounds of trash. The council voted unanimously to have city staff review the proposed ban to determine whether it meets legal standards and would be enforceable, among other things. After that review, city officials will schedule a public workshop on the proposal to solicit feedback and to gauge whether it needs any changes before it returns to the council for a final vote.